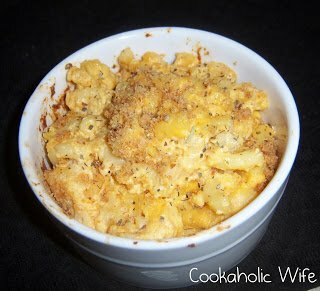 Macaroni and cheese is one of those meals that I’m always looking for the perfect version. I’m starting to wonder if it just doesn’t exist. Or maybe I’m just too picky about my mac and cheese. Luckily, its one of Tom’s favorite foods so he doesn’t mind eating each recipe in my quest for the perfect one. Since my stove/oven versions of mac and cheese have been good, but not amazing, I decided to try out a crock pot recipe to see if that’s the secret. 1. Fill a large pot halfway with water and bring to a boil. Add a pinch of salt and the elbow macaroni. Cook the macaroni for 5-7 minutes or halfway through the cooking time listed on the box. 2. Spray the inside of your crock pot with non-stick cooking spray. Combine the evaporated milk, milk, butter and eggs in the crock pot. Whisk until smooth. 3. Add the cheddar, Velveeta and Parmesan cheese. Drain the pasta and add to the slow cooker. Stir in the paprika and dry mustard. 4. Cook on high for 30 minutes then reduce the temperature to low and cook for 3 – 3 1/2 hours. 5. Season with salt and pepper to taste, or use the optional toppings. 6. Preheat the oven to 350. Transfer the mac and cheese into a 9×13 baking dish or into individual ramekins. 7. Melt the butter and mix in the breadcrumbs until lightly coated. Sprinkle over the mac and cheese. Sprinkle with Italian seasoning and crushed red pepper. 8. Bake for 3-5 minutes or until breadcrumbs are browned. Season with salt and pepper to taste. This was some really yummy mac and cheese. While eating my bowl of it, I decided it currently held the top position for best mac and cheese, but that my quest to always find a delicious mac and cheese recipe would probably always continue.